Heat Gun Comparison: Electric ‘vs’ Gas. Which is Best for Shrink Wrapping? 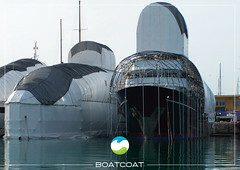 Boatcoat have conducted extensive testing running an electric heat gun and a gas heat gun ‘side by side’ to see what are the advantages and disadvantages of each type of heat gun when used for the shrinking of shrink wrap plastic. Weighing in at 5Kg (including the cable), the electric heat gun would be tiring to use for an extended length of time; it is heavier as well as more unwieldy than the propane heat gun due to the design of handle which is positioned on the top of the tool, causing the tool to hang down from the operator’s arm, making manoeuvrability difficult. Due to the slower nature of the heat gun, achieving a consistent finish on the shrink film is easier than with the propane tool. The on/off switch is positioned on the rear of the tool away from the handle, it is not easy to operate using gloves (as required for welding & Health & Safety) therefore once the tool is operating it is not easy to switch off, if dropped for instance, the tool would remain on and could cause a fire before someone was able to reach it to turn it off. The face of the tool doesn’t incorporate a heat guard and it therefore very difficult to maintain a constant distance from the shrink-film. The electric tool does feel safer to use and operators will probably be less apprehensive about using it initially, however, the output is stated as being 650°C which is actually a higher temperature than the propane tool (which with a flame guard fitted is restricted to somewhere in the range of 340-600°C). If it isn’t actually any safer, it may even be dangerous to give the operator a feeling of safety on a ‘familiarity breeds contempt’ type argument. The electric tool is powered by a 3-phase 415V 13A supply, and so depending on the environment, it may be difficult to find the correct socket. In addition, long trailing 415V cables could be a trip and electric shock hazard. At only 1Kg in weight the propane tool is substantially lighter than the electric tool; it also has a pistol grip which makes it less tiring during extended use and has been designed with the shrink-wrapping of large objects in mind. Being faster and more powerful than the electric tool, it takes more skill to achieve a consistent, tight finish. 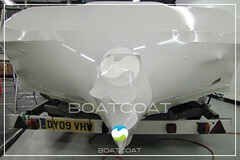 With experience though, it is possible to achieve the same finish as with the electric tool. The on/off switch/trigger is incorporated into the pistol grip so that it is easy to operate and should the tool be dropped it automatically turns off. The flame guard extends approx 20cm from the combustion chamber and completely encloses the flame; it must be fitted to the tool to achieve UL listing, and means that the higher output temperatures of the tool can not be used. 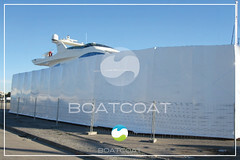 The guard makes it easier to maintain a constant distance from the shrink film, however, it does heat up during use and will cause holes in the film on contact. 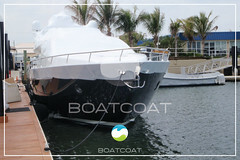 Boatcoat primarily recommend the propane gas heat gun, this is for a number of reasons. First and foremost, the level of heat delivered by the electrical heat gun is low in comparison to its propane counterpart. This leads to a much longer time during application to complete the same tasks, meaning that the propane gun allows quicker, easier installation and a faster “shrinking-off” effect. Secondly, the propane gun is a considerably cheaper option than the electrical gun. With these two factors in consideration many users opt for the cheaper gun, that proves to be more effective during use. This does vary dependant on situational factors however, as the propane gun comes with obvious fire risks that arise from the naked flames. Where there is an issue with fire risks there may be a requirement to use the electrical gun as the gas gun may not be appropriate in these select environments. Finally, although shrink wrap heat guns are easy to use devices, in daily use by many thousands of companies, you should always ensure that staff have been fully trained, that the manufacturer’s instructions for each model of heat gun are followed and that all risks have been assessed. 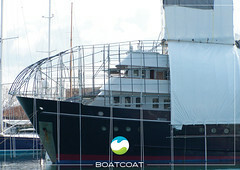 Boatcoat also provide training courses in all aspects of shrink wrap installation, to find out more click here. 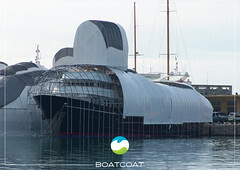 Boatcoat supply both heat guns discussed within the article. 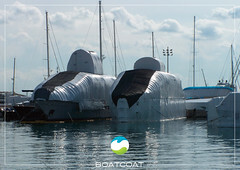 If you require more shrink wrap gun information on what’s right for your applications or costs of purchasing then contact us on 01752 227333, or email info@boatcoat.com. 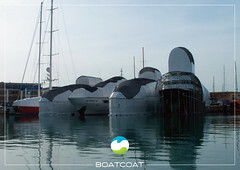 Writer and communicator of all things Boatcoat and the various applications that arise from this innovative product range. 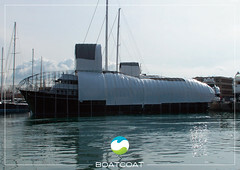 Can I Become a Boatcoat Approved Installer?